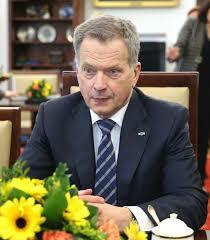 Finland’s President Sauli Niinisto has been comfortably re-elected for a second six-year term. Mr Niinisto secured 62.7% of the vote in Sunday’s poll, easily beating his Green party rival (12.4%), according to official results. He is the first candidate to win in the first round of voting since the electoral system was changed in 1994. “I am very surprised at this kind of support. I must think hard how to be worthy of it,” he said. “I have no intention of making changes just for the sake of making changes,” the 69-year-old told reporters after the result. Mr Niinisto won popularity by maintaining relations with Moscow, despite Finland backing economic sanctions against Russia over its annexation of Crimea from Ukraine. In 2012, he won the presidency as a candidate for the centre-right National Coalition Party, but he campaigned as an independent in this election. His nearest rival, Pekka Haavisto of the Green Party, congratulated him on his victory. “Niinisto has clearly won this race, my warm congratulations to him,” he said. Laura Huhtasaari from the nationalist Finns Party and independent candidate Paavo Vayrynen, won 6.9% and 6.2% of the vote respectively.